THE SECRET TO SOFT LAYERED CHAPATIS. After the numerous requests on how to make soft layered chapatis I have decided to post a detailed recipe and tips on how to make soft and sweet layered chapatis. -water and/or milk. (room temperature or slightly warm). -Combine 4 cups of all purpose flour, 1/4 cup of sugar, a 1/2 a teaspoon of salt and 1/2 cup of vegetable oil in a bowl. Using your hands or flour mixer, mix these ingredients well until they all come together. Buying time for succession without having to train a follower? Heavily armed members of Uganda’s elite anti-terrorism police stand guard along the neatly manicured perimeter of the US Embassy in Kampala. Occasionally they shout commands and point their guns. For security reasons you are not allowed to stop or park a car within a certain radius of the US Embassy on plot 1577 Ggaba Road, Kampala. Offenders tend to be first time visa applicants. Security in Uganda, and especially in the capital city, Kampala, is ubiquitous. Armed men and women can be found every 100 meters on the airport road when the country is hosting visiting dignitaries. Ggaba road, where the embassy sits, is a busy road with privileged traffic. Ear-splitting sirens hustle ordinary commuters out of the way as armed convoys shuttle big men to and from the nearby Speke Resort Hotel, a posh conference centre sitting on the edge of Lake Victoria. Africa should learn from a Masai Homestead instead of depending on Development Aid. I did not know that the Masai tradition is coupled with leadership democracy that is more unique than the Western democracies. The hidden secret has gone for centuaries in a ritual process to choose a leader after every ten years from a youth training camp and the chosen leader has to take the budden of leading the group baring responsibility for both good and bad deeds of this group. It is not just the Masai Homestead as seen from a Western birds eye view but a complex University where adolescent excellence is exhibited. The Kenyan economist Shikuku James Shikwati might have seen the first snow in Berlin this year but he chose the story of the Masai as an intro to his theory of boycotting the Western Development Aid for Africa to drive the point home. He is coordinating an Inter-regional Economic Network from Nairobi. James Shikwati knows very well that for over 50 years, Africa has been getting development aid that has never changed the situation on the continent and for him the sovereinity of Africa based on robust infrastructure is the alternative to counter this dependency. I found myself sitting among the many students and individuals who had come to listen to this indigenous economist from Africa who has written several books and stood on his analogy of pulling Africa out of the statusquo. The continent has all the rich natural resources and a potential to sustain itself, all that is needed was to anchor the sovereinity as a bargaining power. If the topic “Stop development Aid to Africa” could attract such a large audience to listen and discuss with the Guest of honor James Shikwati, then the different opinions expressed during the debate definately anchored the very theory advocated by this African economist. He was of the opinion that International institutions like WTO, IMF, World Bank etc need to be democratized so that the sovereinity of Africa can be guaranteed. I was not surprized to note that diaspora Africans among the audience got more interested in the discussion rather than the majority Europeans who only listened attentively. The American gentleman who thought that millions of dollars collected in Seattle to fight Malaria in Africa was a good example of Aid for Africa forgot the fact that Malaria continued to kill more children in Africa dispite this guesture. Pharmaceutical companies use data collected on immunization and research for own profits and the killer mosquito remains immune to the medicine given to prevent Malaria. Unfortunately time ran out for questions and the audience was refered to the next ssesion that was to take place the next day at the Otto-Sur Institute in Dahlem. Thanks to Africavenir, the think Tank that organized this discussion. Fifty-five years later, there are only three (3) tractors (the type of Massey Ferguson that can plough) in Masaka, Bukomansimbi, Lwengo and Kalungu districts, perhaps because the land has also been too much fragmented. 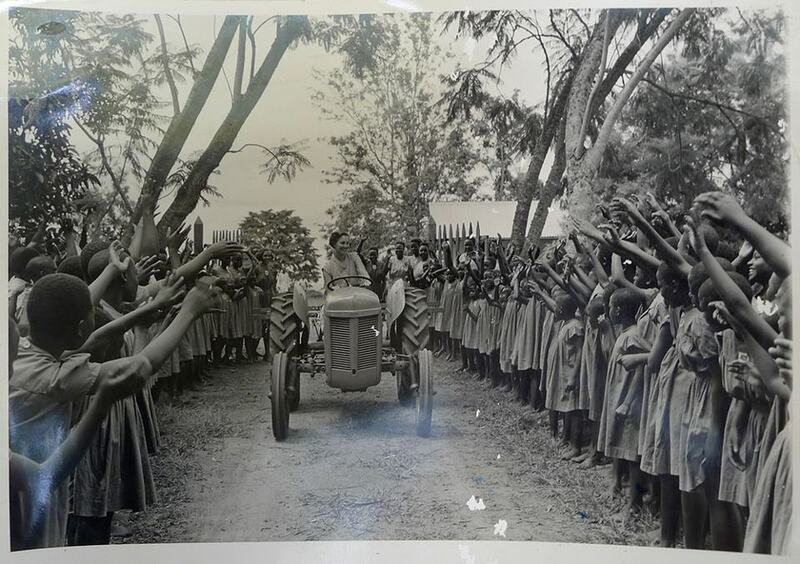 One of the three tractors (my father and I call them karakita) is stationed at Kamenyamiggo Agricultural Centre. At least let us be aware of such ugly facts to know the descending highway our country has been fast sliding especially from mid-80s. Sadly, it continues to dive into the abyss. I regret to have been tongue tied on Monday the 10th of September, 2012. This was the day when I had a chance to meet some one I adored in my youth time, some one whose writings inspired me to love literature since I was a school boy. I sat among the audience that had come to listen to a great African novelist and author of several literature books. I was with a friend who had joined me before the begin of the session but had no idea who this Professor of comparative literature was. None the less the theme of the evening was “The portrait of an African dictator” based on the book “Wizard of the Crow” written by Professor Ngugi wa Thiong’o. The hall of the adjacent stage at the Berliner Festspiele house on Schaperstrasse 24 looked like a haunted theater venue with a jar of water, three empty glasses and three microphones placed on a wooden table. Three old fashioned antique chairs for the panel stood in the middle of the stage behind the table to face the public. The background of the stage was a designers’ menu as the sound technician kept on switching the microphones from one speaker to another from the back bench. At exactly 21.00 hrs European Time, came in the two members of the panel with the guest of honor through the side door entrance and sat at the table, the house applauded with a clap of hands. A brief welcome introduction with the background information of the author was given before the stage was set for a literary evening to analyse his book that was selected for the International Literature Festival in Berlin this year. Professor Ngugi wa Thiong’o was asked to explain why he chose to write his books in the native language and later translate them into English language. He stood firm to defend his thesis on the equivalence of all world languages as a means of communication and regretted that only colonial languages were imposed on us as languages of power, education , judiciary and commerce. He did not believe in African literature written in colonial language and asked the audience to imagine German literature being written in Zulu Language to see the comparison. The lady who sat in front of me with a mobile phone that kept on ringing with a loud beep was technically bankrupt. She fumbled to switch off the gadget and in the process did not register that Professor Ngugi wa Thiong’o promptly juxtaposed the sound of her phone to describe not only an African dictator but many different characters that included dictators like Augusto Pinochet of Chile, Ferdinand Marcos of Philippines, and even the host country Germany as history has recorded. As passages of the “Wizard of the Crow” were being read in German language, Professor Ngugi wa Thiong’o amused the public by saying the German version of the novel appears to be more exciting than the original version. The couple that decided to leave the hall from the back bench with their loud shoe steps might not have realized that the Professor was comparing a global world where capital transfers to maximize profits without boarders is a global problem with a subservient consequences. The colonial languages are the vehicles used to extend this dictatorship as they become the forms of power, education, commerce and judiciary.